When you think of New Orleans, you probably envision the French Quarter, jazz musicians, Mardi Gras celebrations, or their famous signature sweet beignets from Café du Monde. But, New Orleans is also known for something else - the important role it played in the history of United States coinage. Established in 1835, the New Orleans Mint was considered the most important U.S. branch due to its geographic location next to the Mississippi River and proved to be the most dependable mint in the South before and after the Civil War. The New Orleans Mint produced over 427 million gold and silver coins during its time, and is one of the most popular mintmarks sought after by coin collectors and investors. Back in February, our rare coin expert, Doug Winter, had come across a rare group of “No Motto” $10 eagles from the New Orleans Mint. The coins were produced in the rarest ten-year span of that Mint, and had been hidden away in European banks untouched for decades. Proving just how popular they are, all of the $10 eagles Doug had found, sold out. Due to the extreme popularity and high demand we received since then for those coins, Doug continued his search and has found a small, but special group of “No Motto” $10 eagles from the New Orleans Mint available exclusively to ASI readers. The New Orleans Mint’s main focus was producing silver dollars, so coming across $10 gold eagles from the rarest ten years of production is truly a great find! The New Orleans Mint was established in 1835 by Andrew Jackson, citing a need to increase U.S. coin production. Due to the consistent shortfalls of the Philadelphia Mint, the only existing national Mint at the time, the New Orleans Mint, was established because of its strategic location along the Mississippi River and its proximity to the Gulf of Mexico. 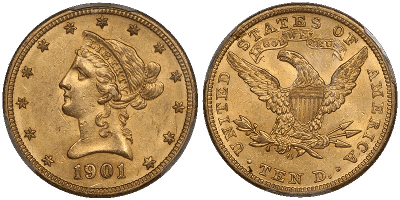 Production of U.S. gold coins began in 1838 and continued until 1861, when Louisiana officially seceded from the United States. After the war, the Mint remained unused throughout the reconstruction era of the early 1870s. After closing in 1861, the New Orleans Mint reopened for minting in 1879. 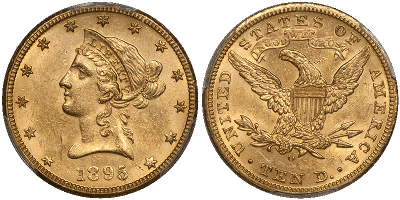 During this year, they struck silver dollars, eagles ($10 gold), and double eagles ($20 gold). 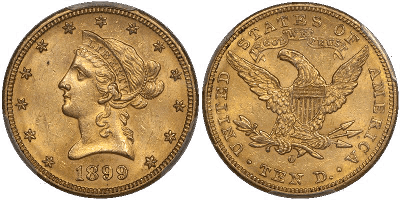 Between 1879 and 1906, only 15 issues of $10 eagles were made at the New Orleans Mint. These range from very rare to moderately scarce, and today, the ‘With Motto’ New Orleans eagles are avidly collected by date set with many collectors working on complete sets. The below $10 eagles come from a European source who sells Doug many American gold coins. Each coin in this group has a “crusty” appearance with rich old gold color and excellent surfaces. This date is moderately scarce in MS62, rare in MS63, and all but unknown in grades higher than this. Doug has found a group of four coins, all graded MS62 by PCGS. Three of these coins have CAC approval, one does not. PCGS has graded a total of 98 examples in MS62 with just 25 finer. The CAC population is 15 in MS62 and four finer (all MS63). The 1899-O eagle is the undisputed key issue in the “short set” of “With Motto” New Orleans eagles. It is scarce in MS62, rare in MS63, and very rare above this. This nice MS62 example is really pleasing for the grade, with good color and minimal abrasions. PCGS has graded 47 in MS62 with 21 finer. CAC has approved 11 in this grade and 12 finer. The PCGS Price Guide has a suggested value of $2,750. This 1901-O is a reasonably common date which is significant as the first 20th century eagle from the New Orleans Mint. It becomes rare in MS64 and Gems are very rare and expensive. This is a nice, attractively toned piece with good luster and no severe marks. PCGS has graded 156 in MS62 with 102 finer. CAC has approved just nine in MS62 with 17 finer. If you didn’t get a chance to take advantage of our last New Orleans $10 eagle offering, now is the time to do so! These $10 eagles have outstanding value and rarity and are your chance to own a piece of history! Call us at 800-831-0007 or send us an email to purchase your rare, New Orleans Mint $10 eagles today! *Prices are subject to change based on market fluctuation and availability. Prices reflected are for wire transfer, check, or cash only. Offer expires April 27, 2017.